"[I]t seems like they are making progress. 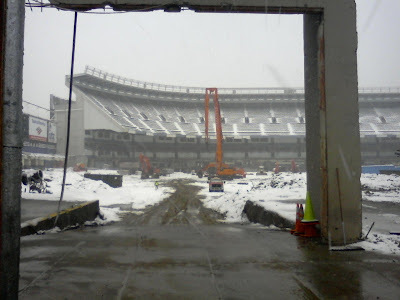 At this point the seating plank for the field and loge levels has been demolished. 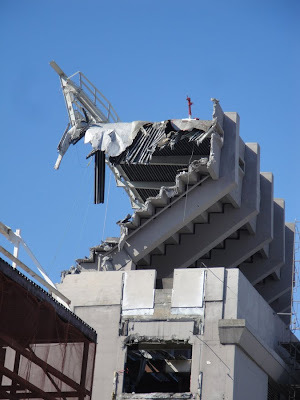 The upper deck is basically intact except for what seems to be the last section. 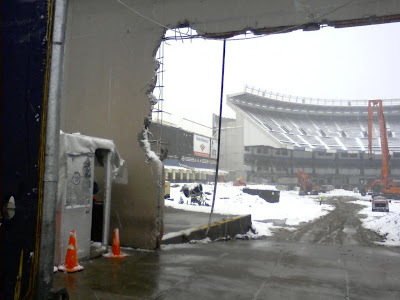 The stairwell 'pod' next to the left field end has been removed which caused that part to be demolished. Most of the exterior remains. If I were to guess, there will still be a considerable amount of the structure left when the season begins in April. However, if the pace is increased, it could be done before then." View the rest of his photos here. 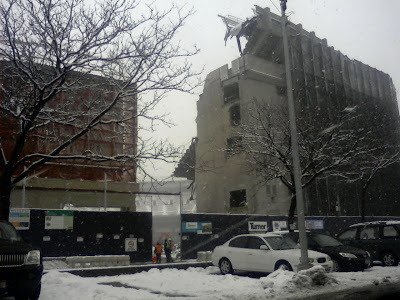 It makes me sad to see the dismantling of the Stadium. Boo hoo for real. yeah, we all knew these days were coming... when the city lost another icon. Still, it's difficult to see this happen. stupidest thing ever. this and shea. for too many reasons to list. Why did you ruin a perfectly good February day by reminding me that the Yankees exist? Go Mets. Go Mets indeed! As for dismantling the Skankdrome, that baseball Mordon, den of orcs and Sauronbrenner, just nuke the damn thing. Let it be transformed into one thick slick shield of radioactive glass...oh, sorry, got a bit carried away there. But maybe someone could carry the Wankees away...GO METS! Uh-oh! Didn't realize that we had so many Mets fans!